The video below will look at a three-step trade selection process used to select call option trades with a high probability of success. Call options are derivatives that derive their value from the price of the underlying stock. Call option profits are determined by the price movement of the underlying stock. Step 1 helps us profit by purchasing call options on stocks moving up in price. This allows us to harness the tremendous leverage that options provide. Steps 2 and 3 are especially important during volatile price moves as they allow you to hold on to your call option trade longer before being stopped out. This helps you to better profit during market volatility. As option traders, we are always excited when our trading system or program produces a winning trade. But this poses a dilemma. Do you hold a winning option trade for further upside profit potential or do you take profits in case the underlying stock declines in price with the possibility of a profitable trade turning into a loss? It’s human nature to want to take profits quickly when we have a profit in a trade. We have closed out winning trades only to see the underlying stock continue to rally knowing that we left option profits on the table. Many times, the underlying stock for the call option you own will have a sustained rally producing substantial profits for your call option way beyond your expectations. We also know from experience that it is very difficult to watch a winning trade develop into a losing trade. This is very difficult and can help you lose confidence in your ability to be a successful trader. In this video learn how to solve this dilemma with techniques for protecting your option profits and at the same time participating in any further upside profit potential if the underlying stock continues to rally. This technique is simple to implement and once it is in place you can forget about the trade. No need to monitor the markets or world events. Bad earnings reports don’t matter. A severe selloff in the underlying stock can produce a profit with this technique. You can place the trade and forget about it! Let's explore a strategy for identifying short trades with a high profit potential. It is normally more difficult to profit from short trades when we are not in a bear market as we are trading against the major trend. We use a simple filter before taking a short trade that increases the probability that the short trade with be profitable. This filter is easy to download form the internet and gives us an 'instant picture' as to whether we should be taking short position. We will show actual short trade examples to demonstrate this short trade filter. Even in a bear market we use this filter and we were heavily short global currency, commodity and equity markets during the 2002 and 2008 bear markets using this filter. This resulted in substantial profits from the short side. Learn how a simple trend filter can help you profit from the short side during market corrections. Profiting during a stock market correction can be more difficult than profiting during a bull or bear market when the price trend is more clearly defined. The US Stock Market is currently in correction mode with the S&P 500 Index down more than 10% from its high. It’s too early to tell if this market correction will develop into a bear market with more than a 20% decline in the S&P 500 Index or if we are in a bottoming process similar to the bottoming process that occurred during the 2011 market correction. The following video will explore how to profit during a market correction by using their EMA Trend Following System to select bullish trades in the strongest markets and select bearish trades in the weakest markets. We will look at actual bullish and bearish option trades we took during this market correction to demonstrate the profitability of this strategy. In this video we will explore both bullish and bearish trade opportunities in 2016. Prime Trade Select is the 3 step high accuracy trade selection process we use to select option trades with the best profit potential. Options are the derivatives that derive their value from the price of the underlying stock. Option profits are determined by the price movement of the underlying stock. Learn how Prime Trade Select allows you to identify stocks and options with the best profit potential and profit in any type of market condition. In this week's video we will explore trading ETF options in the strongest market sectors. ETF options are derivatives that derive their value from the price movement of the underlying ETF. We will also look at how to identify a sector moving up in price so we can profit from purchasing call options. Learn how to identify sectors with the best profit potential and how to select a low risk entry point for option trades. We will look at actual sector option trades Chuck took that demonstrate the profitability of this simple strategy. Our sector strategy also takes short positions in the weakest market sectors and allows us to profit in any type of market condition. Our sector strategy performed well during the two severe bear markets in 2008 and 2001 when we were heavily short most global equity markets. This week let's take a look at option directional trades versus spread trades. Bullish call option trades require the underlying stock to move up in price above the option break-even price in order for the trade to profit. Option spread trades on the other hand can profit if the underlying stock increases, declines or stays flat. Option spread trades can even guarantee your trade will be profitable regardless of the price movement of the underlying stock. Spread trades are less likely to be stopped when using a protective stop and have a higher percentage of winning trades compared to directional trades. Spread trades can profit during volatile markets and during non-trending markets. Learn how to set up spread trades that can help you become a successful trader during any type of market condition. Let’s explore how to quickly and easily discover the strongest market sectors so we can initiate long positions with a high probability of success. We will also look at how to identify the weakest market sectors so we can initiate short positions. Sector trading allows us to profit in any type of market. This strategy has been performing well during the current bull market that began in 2009 as well as the two severe bear markets in 2008 and 2001 when we were heavily short most global equity markets. We will look at actual sector option trades we took that demonstrate the profitability of this simple strategy. Most option trading programs focus on trade selection, timing or determining if an option premium is under or over-valued according to pricing models. We can agree that option trade selection and option pricing are important. In this week's video we will explore two simple portfolio management rules that make it possible for an option portfolio to profit even if only 10-20% of your trades are profitable. In this video let’s explore a simple system for finding low risk entries for option trades. Chuck’s brokerage confirmation below shows that he purchased the Netflix Jan 500-Strike call @ 174.50. Netflix had a 7 to 1 stock split and the split adjusted 71.43 Strike call is trading at 54.10 giving him a 117% return in four weeks. 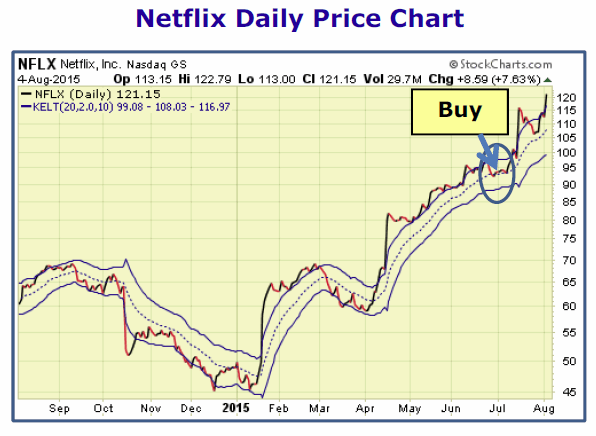 The price chart below shows the low risk entry point for our NFLX option trade. Chuck also purchased Amazon and Starbucks options using the low risk entry system. Learn how to easily spot low risk entries for your option trades. In this video let’s look at a simple money management rule that protects option profits and increases the percentage of winning option trades. The High Accuracy Option Trading Program has produced a lot of winning option trades but this poses a winning trade dilemma. When you have a winning trade you must decide whether to take profits or hold the trade for further upside profit potential in case the trade continues to produce profits. But if you hold the trade and the trade starts to go against you, there is a risk of a profitable trade turning into a losing trade. Chuck knows from experience that it is very difficult to watch a winning trade develop into a losing trade. This is very hard on your psyche as a trader and can help you lose confidence in your ability to be a successful trader. In this video learn a simple rule of thumb that allows you to avoid this dilemma by protecting option profits and at the same time not capping the profit potential of your trade. This money management rule transforms option investing from one of the riskiest investments in the investment universe to one of the lowest risk investments. In the last email we looked at the Prime Trade Select trade selection process used to select option trades with the best profit potential. In this week’s email we will look at Trade Management guidelines. 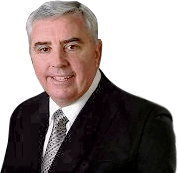 Chuck Hughes’ Trading Program has a long history of profitability and contributed to $7.2 million in actual profits over the past 8 years in all types of market conditions and it continues to perform well. Brokerage account Profit/Loss Reports show that Chuck has more than $1.7 million in open trade profits using the High Accuracy Option Trading Strategy. This week's High Accuracy Option Trading video we will learn how to manage option trades for achieving a high percentage of winning trades. In this week's video we will explore Prime Trade Select which is the 3 step high accuracy trade selection process we use to select option trades with the best profit potential. Options are derivatives that derive their values from the price of the underlying stock. Option profits are determined by the price movement of the underlying stock. If you can identify a stock moving up in price you can profit from purchasing call options. If you can identify a stock moving down in price you can profit from purchasing put options. Prime Trade Select allows us to identify stocks and options with the best profit potential and select a low risk entry point. This week's video will look at trade selection process for finding profitable option trades. Options are derivatives that derive their value from the price of the underlying stock. Option profits are determined by the price movement of the underlying stock. If you can identify a stock moving up in price, you can profit from purchasing call options. Conversely, if you can identify a stock moving down in price you can profit from purchasing put options. Learn how to identify stocks and option with the best profit potential and select a low risk entry point. Copies of brokerage account Profit/Loss reports show that there is currently a $1.209 million in open trade profits using this trade selection process with an average return of 177.5%. In the following video we will look at trading ETF market neutral strangles. ETF strangles have both a long and a short position. The strangle call option profits as the underlying ETF moves up in price and the strangle put option profits as the underlying ETF moves down in price. Once you place a market neutral strangle trade, you can forget about it! No need to monitor the markets or world events. A severe sell off in the markets actually produces more profits with this strategy. You can place the trade and take a vacation! This strategy is particularly successful during choppy or non-trending markets which occur over the vast majority of time. Market neutral strangles can even guarantee a profit if set up correctly. They market neutral calculator below shows the profit potential for an actual NASDAQ ETF strangle trade Chuck currently owns. This calculator shows that Chuck is guaranteed a profit with this trade regardless of the price movement of the NASDAQ ETF at option expiration. Learn how to set up low risk ETF market neutral strangles. The profit potential is not capped. As the ETF moves up the profit increases and as the ETF moves down in price the profit increases. This allows you to lock in a guaranteed profit and participate in the QQQ. The uptrend ETF price is flat, which equals an 87% return and a 10% increase in ETF price of 184% return. You don't have to worry about protective stocks or big down moves. In the following video we will look at a Hughes accuracy trade selection process Chuck uses to select ETF option trades with the best profit potential. ETF options are derivatives that derive their values from the price of the movement of the underlying ETF. If you can identify a sector moving up in price, you can profit from purchasing call options. Conversely, if you can identify a sector moving down in price you can profit from purchasing put options. Lear how to identify sectors with the best profit potential and how to select a low risk entry point for option trades. The following video will explore a simple Relative Strength strategy to select the strongest market sectors to buy and the weakest sectors to short. There is always a bull market and a bear market somewhere. This strategy will allow us to profit in any type of market condition. Chuck's brokerage account Profit/Loss statements presented in this video show that he currently has $440,983.38 in profits using this Relative Strength sector strategy in his two retirement accounts. The main goal of Chuck's stock and option trading is to maintain a profit to loss ratio of at least 3 to 1. This ratio is calculated by dividing your total profits by your total losses and is a good overall measure of reward versus risk. A successful investor wants to achieve the highest profit to loss ratio possible. A high profit to loss ratio is a good indication that you are keeping trading losses to a minimum. Many investors with good trading systems fail because they don't pay enough attention to risk. Maintaining a trading discipline that forces you to think in terms of reward versus risk can help you become a successful investor. In this video we will explore a unique strategy that uses a combination of technical and fundamental analysis to select stocks and options with the best profit potential. Learn how this strategy produced $229,239.29 in current profits and over $1.2 million in actual profits over the last several years. Copies of Chuck's brokerage account Profit/Loss Reports below show that this strategy currently has $229,239.29 in profits in two of his retirement accounts with an average return of 66.3%. The Fail Safe Exponential Moving Average System (EMA) is a technical based investing system that utilizes exponential moving averages to define "buy" and "sell" signals. Technical analysis is a discipline that focuses on historical price patterns, trends and quantitative analysis with the goal of determining future price movements in a stock or index. Trading options is a very high risk strategy due to the leverage provided by options. If you purchase an option, the underlying stock must make the expected price move and this price move has to occur before option expiration in order for the trade to profit. Regardless of what strategy you use to select options, many times call option trades can result in a 100% loss if the underlying stock is flat or decreases slightly at option expiration. And a put option trade can result in a 100% loss if the underlying stock is flat or increases slightly at option expiration. In this video we will explore the Market Neutral Strategy that greatly reduces the risk of option trading and at the same time does not limit the profit potential of a call option trade as the stock increases in price. Many times the maximum risk of a Market Neutral trade can be limited to as little as 6 to 8%. If you have bad timing when you enter a Market Neutral trade, you can simply take your 6 to 8% loss and enter a new trade as you are not exposed to a 100% loss risk. 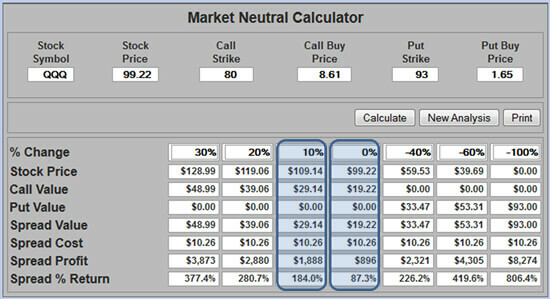 The Market Neutral calculator below shows the profit/loss potential of an actual Home Depot option trade that Chuck Hughes is currently holding assuming various price changes in Home Depot stock from a 40% increase to a 60% decline at option expiration. Chuck's maximum risk on the trade is 8.6%. Chuck's profit potential is not capped and if the stock moves up in price, his profit increases. This trade allows him to take a low risk trade and participate in the Home Depot uptrend. This trade also profits with a big down move in Home Depot. If his timing is wrong he can take his 8.6% loss and enter another trade opportunity. Chuck doesn't have to worry about protective stops, bad earnings reports or big down moves in the stock. In this video we will explore trading options using the Prime Trade Select option selection process. Options are derivatives that derive their value from the price of the underlying stock. Option profits are determined by the price movement of the underlying stock. If you can identify a stock moving up in price you can profit from purchasing call options. Conversely, if you can identify stocks moving down is price you can profit from purchasing put options. Prime Trade Select allows us to identify stocks and options with the best profit potential and select a low risk entery point. Prime Trade Select has produced over $1.8 million in actual option profits over the past five years during very difficult market conditions. Chuck Hughes' brokerage account Profit/Loss statements presented in the following video show 1.824 million in profits with average return of 85%. There were 183 winning trades and 17 losing trades resulting in 91.5% accuracy. Prime Trade Select is a three-step trade selection process designed to select stocks and options with the best profit potential. In this video we will learn how Prime Trade Select produced $3.366 Million in actual profits during very difficult market conditions with better than 90% winning trades. This 3-Step trade selection process has produced consistent profits for Chuck's trading strategy option portfolio during difficult market conditions this year. Currently the option portfolio has $164,467 in open trade profits and an average return of 461.2% with no losing trades. Over the past four years, we have experienced a global financial meltdown, severe recession and bear market, high unemployment, increased market volatility and an uncertain economy. This financial turmoil has made it very difficult for the average investor to realize a consistent return on investment, and make a quality trade selection. Despite these difficult market conditions, My Volatility and Trade Selection Strategies produced $4.4 million in actual profits over the past four years. In this video we will discover spread strategies that work well during any type of market condition. This trade selection process is easy to implement but has been very effective in finding stocks and options with the best profit opportunities. My brokerage account Portfolio Profit/Loss reports below show that I currently have $295,799.77 in open trade profits after commissions. Learn how I used my trade selection process to select the trades in these portfolios.